A little over a year ago we cautioned employers to be careful with summer hires. Make sure summer hires are qualified to do the work. Don’t allow them to operate heavy equipment. And perhaps most important, don’t just “toss them the keys” when driving is required. Today we read in the New York Times (registratoin required) of a tragic accident in upstate New York. A car full of aspiring dancers was on its way to a lake for a swim. The driver sped along narrow roads, reaching speeds of 80 mph or more, until she lost control and slammed into a county dump truck. The small Toyota disintegrated upon impact, killing six people, the driver and five youngsters. It turns out that the driver, 25-year-old Irina Mironova of Miami Beach, Fla., had a suspended Florida license for driving more than 100 mph. To be sure, many people get speeding tickets, but how many involve going 107 mph? This is a blatant case of negligent entrustment: Mironova should never have been allowed to drive. Not only did she have a poor driving record, if asked, she could not have produced a valid license. I have no idea what the finances for running a small camp in the Catskills are like, but the camp would be required to carry liability insurance. In addition to suffering the pain of losing her youngest son, the camp’s owner, Anna Kapitannikov, in all likelihood faces protracted legal actions for this single act of negligence. For lack of a simple check on her counselors’s licenses, her life and her business are in ruins. Good management takes nothing for granted. The fact that someone is 25 and knows how to drive does not mean you can trust them behind the wheel. A little due diligence is always in order. For the few moments that might take, you could be spared a lifetime of grief. We’d like to welcome two new weblogs to our sidebar. We nicked them both from Joe Paduda’s blog, one of our frequent reads. DB’s Medical Rants is a blog by an academic general internist who comments on medical issues and the current state of medicine. Recent posts range from how patients are increasingly participating in decision making to physician report cards. The Health Care Blog by Matthew Holt offers excellent and informed commentary on the healthcare industry and public policy issues related to healthcare. And if the healthcare side of the equation is where your interest lies, we encourage you to check out Medlogs where you can access newsfeeds for dozens of blogs by physicians, nurses, and industry insiders. We have a variety of other good reads in our sidebar, too – check them out. In the aftermath of the March explosion at BP’s Texas City refinery that killed 15 people and injured 170, we are beginning to understand the roots of the problems that led to the explosion. We are also seeing BP’s damage control in action — a far more impressive operation than the safety program that preceeded the disaster. In a detailed and compelling article by Chip Cummins and Thaddeus Herrick in the Wall Street Journal (available to subscribers only), we see the elements of a classic invitation to disaster. BP bought the facility from Amoco in 1998. Prior to that, Amoco apparently had cut back on staffing and deferred routine plant maintenance. By the time BP took over, there were deeply rooted problems in the plant’s infrastructure that were, in effect, an invitation to disaster. Workers reported problems with severe corrosion throughout the plant. The place was literally falling apart. That supervisor is a co-plaintiff in a defamation suit against BP. His attorney said that his client left to attend emergency surgery for his son, who had broken his arm the day before. The supervisor claims that he lined up a replacement to supervise the start-up and shouldn’t have been fired. The bottom line, of course, is that the supervision was inadequate. By 12:40 p.m., pressure and heat had climbed above normal levels in the isom unit’s processing tower, where gasoline components are separated. A worker outside the unit called the control room to report steam-like vapor coming from the unit’s smoke stack, an indication that something might have been going wrong. Unfortunately, nothing was done about it. At about 1:20, a small explosion occurred, followed by a much louder one. People working on the isom unit, along with people in trailers (placed too close to the isom unit), were killed and injured in the disaster that followed. Here is BP’s classic description of their safety program, which shares a fatal flaw with many such programs in thousands of workplaces: “I think the culture of safety, in terms of policies and procedures, was there,” said Ross Pillari, president of BP Products North America. “But the implementation of these policies and procedures was clearly not there, because if it was, the accidents wouldn’t have happened.” In other words, we had a written safety program, but people were not following it. I imagine that there was an explicit drill for shutting down and re-opening the isom unit. But it’s all too clear that these procedures were simply not followed. In addition to the March incident where 15 people died, there were five additional fatalities in BP facilities in the US, compared to a single fatality in facilities operated by two larger refiners, ConocoPhillips and Exxon Mobil. Draw your own conclusions. BP is walking an interesting line in its response to the accident. While it has denied any negligence and is cooperating with federal investigators, it has also apologized and has moved aggressively to settle out the claims of victims and survivers. At the heart of their strategy is a $700 million kitty to pay settlements (a raw average of $3.8 million). A number of employees injured in the blast have raised serious safety issues; the company responds not through denial or acceptance — they simply seek to settle with these employees (which puts an immediate end to the employees’ public statements). You can find a lot of fault in BP’s procedures prior to the accident. You can and should raise questions about cutbacks in staffing levels, over-reliance on contractors, inadequate plant maintenance, lack of safety training for staff and contractors. But now that the dust has literally settled, BP management deserves credit for taking responsibility and for moving aggressively to take care of the victims. They are not in denial about management’s responsibility for what happened. It’s hard to deliver credible damage control when you refuse to acknowledge the mistakes that have been made and when you put your energies into blaming others. I am impressed with BP’s approach and would encourage other entities — both private and public — to do the same when confronted with disasters of their own making. Michael Forman, 39 years old, is a Suffolk County policeman with 13 years on the job. During that time, he received nine awards for exceptional police work — and filed 12 workers comp claims. It’s the last of these claims that has brought him his current notoriety. He says that he hurt his wrist in April of 2003 — an injury of unspecifried origin, but so severe he could not drive his car, pull the trigger of a gun or even answer a telephone. He’s been collecting 100% of his average weekly wage (tax free) plus his other benefits for over two years. Because the indemnity is tax free, he is actually making more money by not working. In all, he’s collected about $250,000 in disability benefits since he left work with his injury. He was recently indicted for workers comp fraud (though under comp rules, he continues to collect a pay check). Over today’s wires comes the news that a federal appeals court has just upheld workers compensation as the exclusive remedy for the nine surviving victims and the families of the six workers who were killed in the 2003 Lockheed Martin shooting in Meridien, Mississippi. According to the news report, this would limit damages to about $150,000. The Picayune Times has a longer story detailing the appeal a few weeks before the judgment. Exclusive remedy is a strong concept that holds up under repeated legal challenges. Workers comp is no fault by its very nature, a quid pro quo arrangement in which employers agree to provide medical and wage replacement to injured workers, and in turn, this becomes the sole remedy. In all but the most unusual circumstances, employees lose the right to sue their employer for work-related injuries. Sometimes this seems unfair to a worker because benefits are paltry when stacked side by side with enormous awards from civil litigation. But when legal challenges succeed, they weaken the system’s underpinnings. Workers comp is essentially a safety net, a system designed to provide the best for the most, not to provide individual redress for every wrong. The first of what promises to be thousands of lawsuits pertaining to Vioxx is currently underway in Angleton TX, a town of 18,000 people. According to an article in the New York Times (registration required), famed plaintiff attorney W. Mark Lanier has zeroed in on a letter sent by Merck to physicians in 2001 which significantly understates the heart risks faced by patients taking the medication. The letter says that only 0.5 per cent of patients in a clinical trial experienced problems. The real number was more like 14.6 per cent experiencing some problems, with 2.5 per cent encountering serious problems such as heart attacks. “Y’all didn’t tell him the truth about the safety of Vioxx, did you?” Lanier asked Dr. Nancy Santanello, a senior Merck scientist. Y’all in big trouble, for sure! In the course of just four years in the marketplace, Vioxx was prescribed to 20 million people. In the workers comp system, it became the third most prescribed drug, just behind Oxycontin. While Oxycontin has proven to be highly addictive and a favorite of illicit users, Vioxx was never abused for pleasurable side effects. It was marketed as an anti-inflammatory medication for treating arthritis and pain. The drug was voluntarily withdrawn from the market last September. Lancet, the British journal, says that the company had enough alarming data to pull the drug all the way back in 2000, prior to the blandly worded letter that went out to physicians in 2001. The drug is gone, but the lawyers are not going away any time soon. The financial implications are enormous. Epidemiologists have estimated that tens of thousands of Vioxx users may have suffered serious side effects from taking the medicine. One estimate has Merck paying out $18 billion — big bucks even for a drug company. If you google “Vioxx” you come up mostly with lawyers, who are offering free evaluations of your situation online. In its short but highly effective shelf life in the American marketplace, Vioxx became a best seller in the workers comp system. As the liability saga unfolds in courtrooms across America, workers comp insurers will be more than disinterested bystanders. Here’s why: heart attacks and strokes are known side-effects from taking Vioxx. Assume a worker took Vioxx for work-related lower back pain. In the course of treatment, he suffers a stroke and is permanently disabled. While there may be recourse in suing Merck, the first line of defense is workers comp: “I took the medicine for a work related injury. The medicine caused my stroke. Therefore, the stroke is causally related to my work injury.” Up go the reserves, up go the payments, up go the premiums. Is there a lesson here? We think that doctors are making some peculiar decisions in relying so heavily on exotic medications such as Vioxx and Oxycontin. We question the process that leads doctors to pick the most expensive medication where other proven, less expensive alternatives are readily available. We remain sceptical of the influence that drug companies exert on which medicines are prescribed and when. Perhaps insurers and pharmacy management programs should hand out free mugs to every physician in their networks, emblazoned with the motto: “Remember Vioxx.” It won’t cost much and it just might save a lot of money in the long run. We’ve been monitoring the rate setting drama in New York, one of the big four in overall costs of workers compensation (along with California, Texas and Florida). New York rates dropped dramatically in the mid 1990s and then held pretty steady for the remainder of the decade. As in many states, the rates have sharply declined from those of the early 1990s — in New York the overall decline was about 30 per cent, which is pretty good, but still well below the Massachusetts benchmark of over 60 per cent. When we blogged the rate debate in May, the state rating bureau was looking for a 16 percent increase — which would have been the first increase of any kind in 10 years. Rest assured, rate setting is a hot political issue: any request to raise the rates is countered by intense pressures to lower them. At one point in the recent Massachusetts debate, there was more than a 30 point spread between requested rate reductions and rate increases. As for double digit rate increase requests, forget about it. Viewed politically, it’s hard to generate support for rate increases. Insurance companies do not generally enjoy widespread public support. Does anyone really want to “do it for Hank” (Greenberg, formerly the head of AIG)? Insurers might have marginal profits or even losses, but the real bottom line is the cost of doing business in the state. Workers comp is mandatory, a fundamental cost of business. No governor wants to make business more expensive. Indeed, with the price of real estate and the overall tax structure, not to mention the onerous New York Labor Law, the cost of doing business in New York is already painfully high. So it’s no surprise that after looking at the numbers, the state would only approve a token 5 per cent increase in the comp rates. For a primer on rate setting and other comp essentials, NCCI has a nice outline here. One of things you learn is that a 5% rate increase does not mean that all classes rise by 5%. Rates will rise an average of 5%. The final rates are based upon losses within individual classes. The rates for some classes will go up 5% or even more and rates for other classes might actually go down. Insurance companies will thoroughly analyze the data, in order to determine which classes have the most potential for profit in New York. 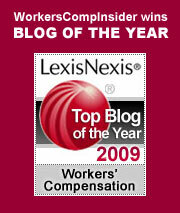 What is perhaps lost in the rate debate is the quality of a given state’s workers comp program. Too often, rate setters and politicians lose sight of the program’s real goals. Does the system fairly balance the interests of employers and injured workers? Have reforms and lower costs come at the expense of injured workers? Are the incentives for employers to operate safe workplaces and to return injured workers to productive employment properly aligned? Does enforcement focus relentlessly on the potential fraud: not just the occasional employee fraud, but the big bucks generated by unscrupulous attorneys, health providers and employers? Lurking beneath every rate setting debate is dark and intricate landscape full of fear and hope, greed and exploitation, dreams and nightmares. From our perspective, in the world of comp there’s rarely a dull moment. I was catching up on back issues of Business Insurance this past weekend and came across an interesting recent decision by the Supreme Court of Kentucky involving the going and coming rule. By way of introduction, the going and coming rule has to do with employees traveling to and from work. Generally, any injuries that an employee would suffer while traveling to and from work would not be compensable. There are several exceptions to this rule and the case of Warrior Coal Company LLC v. Stoud (pdf) offers an illustration of one such exception. This case dealt with a worker who was driving his own vehicle to work and who turned onto a private access road leading to Cardinal Mines. This road was owned by his employer, used exclusively by the company, and was part of the company’s operating premises. While driving on the access road, the worker fell asleep, drove off the road, and hit a tree, sustaining a neck injury. The employee filed a claim for benefits, which his employer denied, stating that the employee’s injuries were not caused by employment and that “falling asleep was a substantial deviation from the employment.” However, an Administrative Law Judge determined that the worker was indeed eligible for benefits and this decision was upheld by the Court of Appeals. The employer subsequently appealed to the Supreme Court of Kentucky, where the prior decision for compensability was upheld. “The theory for the exception is that coverage should apply when an injury arises from a peril that is related to the employment, regardless of whether it occurs at the actual worksite. Consistent with the theory, an injury that occurs while the worker is on a personal mission that substantially deviates from the employment is not viewed as being work-related even if it occurs on the employer’s operating premises … But an injury is compensable if the worker is engaged in normal coming and going activity at the time it occurs and has access to the place where it occurs because of his employment. In this case, the court did not see falling asleep as a sufficient deviation from employment. Workers comp has many gray areas and every state has different laws. Even when states have similar laws, courts can interpret them very differently. The following are common exceptions to the going and coming rule, but you should check with the law in your state. Salespersons, visiting nurses, and other workers who spend a great deal of their time on the road or on call. Because travel is an integral function of the job for these employees, and because they do not operate from a fixed locale, they are often exempt from the going and coming rule. Supplied transportation. When an employer supplies a vehicle or pays for transportation, any injuries tht occur are often found to be compensable. Business travel away from home. Courts are generally liberal in determining compensability for accidents occurring during business travel away from home. Injuries that occur during recreational pursuits or other activities may be deemed compensable while traveling away from home, even if these activities would not be deemed work-related at home. Driving in a “zone of danger” or an area of special hazards. Such a situation might occur if an employee has to drive through a particularly dangerous area, such as a blasting zone or construction site, to get to work. Dual purpose. An example of this would be an employee who is driving home from work and performing an errand for the employer on the way. If the employer is deriving benefit from the employee’s actions, any injuries that occur may be compensable.